The relationship between an affluent investor and a financial advisor benefits from having a long-term status. The time an advisor spends getting to know the attitudes and needs of the investor pays off in the long-term as the investment decisions work out and the relationship extends into other products and maybe into the family’s next generation. But investors change advisors from time to time. The value of the relationship from an investment and profit standpoint is balanced by deficiencies in some other areas which investors hold dear, and that causes them to move on to another advisor relationship. Obviously, another possibility is that investors change advisors because they do not like the level of financial gain they are receiving in their current advisor relationship. Spectrem’s study Advisor Relationships and Changing Advice Requirements asks investors to explain why they would go to the lengthy process of leaving one advisor or provider and move to another. When Millionaire investors with a net worth between $1 million and $5 million were asked to detail the reasons they would change advisors, 55 percent pointed to phone call communication, saying “not returning phone calls in a timely manner’’ would cause them to look elsewhere. Can you imagine losing a client over poor phone call etiquette? It’s probably not a result of a one-time event, but poor communication habits over time could be the cause of an investor departure. There is another form of communication that would cause a Millionaire investor to change advisors, and that is failing to provide “good ideas and advice”. 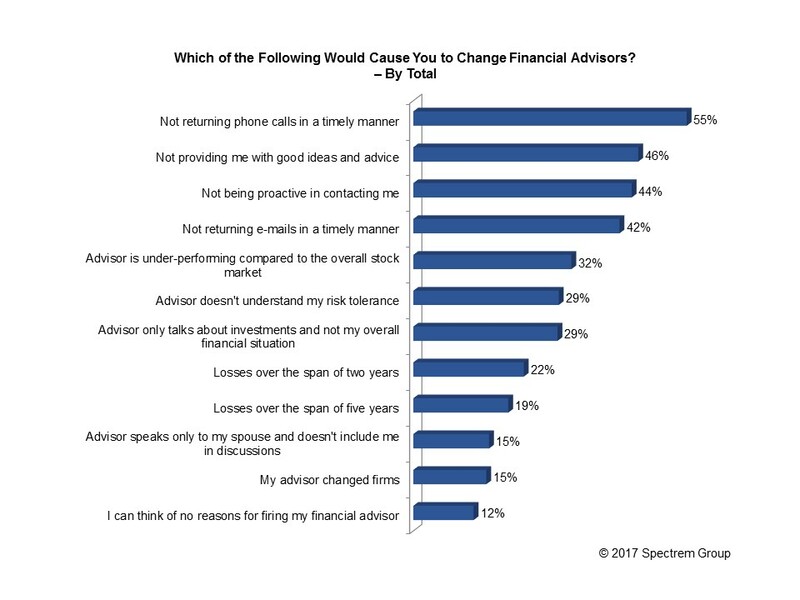 Millionaires want proactive advisors, and 46 percent said they would change advisors if they were not getting strategic advice from their current advisor. Forty-four percent pointed to a lack of proactive communication, in which the advisor places the first phone call, as a reason to change advisors. One of the key components of an investor-advisor relationship is understanding the investor’s risk tolerance, which should be part of an introductory conversation and should be consistently checked over time to see if there are changes in an investor’s attitude toward risk. Twenty-nine percent of Millionaires said they would change their advisor if they did not feel the advisor understood how they feel about risking their investable assets. So what about actual returns on investment? Only 22 percent of Millionaires say losses over a two-year span would cause them to change advisors, and only 19 percent said losses over a five-year span would cause the same reaction. This is one topic about which it is not all about the money. Considering the expense in terms of time that comes with changing advisors, it probably takes a truly poor performance in some area to cause an investor to leave. While advisors cannot control the markets, and investment values fluctuate over time, there is no excuse for losing a client because of poor communication. Ask your investors how they feel about all of your modes of communication, and act accordingly. Whether it is newsletter communication, blogs, phone calls or emails, make certain you are responding to investors the way they want to be responded to. The other reason investors have for leaving an advisor is proactive communication. It’s better to make a proactive call and be told by the investor he or she is not interested than it is to find out an investor has left your services because you did not place the call in the first place.